Kristen is the quietest person I ever met. We haven’t talked for at least two years while in the Sustainability program together. She always had these projects going on, but I never knew what she was doing for years because we simply never talked around me. Then, we took this ecotoxicology class together and have been inseparable ever since. Kristen is also a Sustainability major, and is going to be graduating a year after me. She is one of the most kind-hearted people in the entire program, and is a major animal rights activist and social justice advocate. Though, she has her own style about making change in the world. Instead of only talking about changing our communities for the better, she lives what she says. Those plans turn into actions that directly impact her community, and she hasn’t even graduated yet. During our Ecotoxicology class, the study of how toxic chemicals are impacting our environment, we culminated our semester with a class project. Every student was to create a research project that looked at a community-wide health problem, and offer sustainable solutions. Without even skipping a beat, Kristen decided that it was time for her community in Lawrenceville to have a community garden. While she did not declare this right away, and took a while to realize exactly how the project would be implemented, she had the determination to make this vision into a reality. Several months later, she helped put together a sustainable growth initiative for children in her community. The program will continue with her leading the way, months after the end of the class. 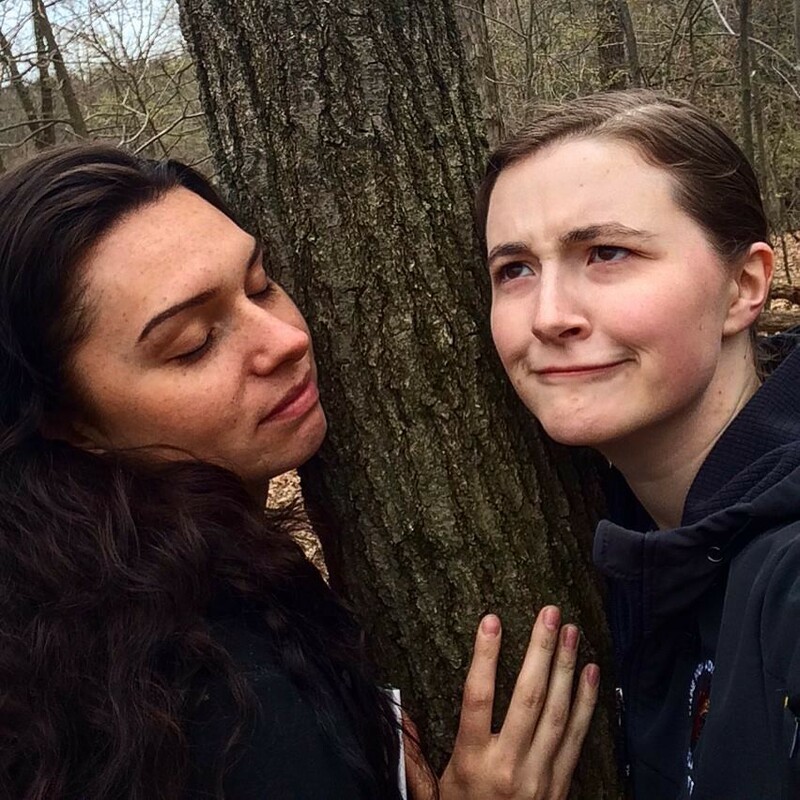 Kristen and I tagging a tree during a Qualitative Ecology Lab. No one could identify the tree at first, so we tried listening to see if the tree could tell us what species it was. We also took this Qualitative Ecology class together where every week we would go on field trips for labs. These field trips studied anything from tree biomass density, to fish biodiversity metrics. We learned how to synthesize the data through parametric statistics. Even though neither of us were math people, we ended up still getting some of the highest grades in the class because the content was so interesting. We both agree that it is nice to be able to still learn these advanced concepts without being penalized for not being a natural STEM focused student. Kristen was able to turn her knowledge she gained from the program, back into an immediate real world application. She is also a fellow business owner who manages a sustainable cleaning company within her local community. Even though neither of us were math-gifted, we still use parametric statistics in our businesses. For Kristen, it helps her better understand the relationship between the consumer and the service she provides. It helped her see opportunity and put everything in perspective. Business projects and math questions aside, Kristen’s main focus is helping people suffer less. It’s easy to get wrapped up in the sustainable jobs and technology, and lose sight of what really matters: people matter. Kristen never forgets this, throughout her projects, and its the biggest reason why she is one of the most motivational students in at Chatham. Allie studies Sustainability in Pittsburgh and works at a canoeing camp in the North Maine Woods during the summer.